The name says it all... The Palmer Course was designed by the legendary Arnold Palmer and the Palmer Course Design Co. And it certainly doesn't disappoint. 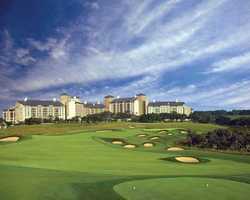 The course, together with The Resort Course at La Cantera, were the first public courses in South Texas to provide 36 holes of championship golf designed by golfing legends. Pristinely perched on 225 acres, The Palmer Course offers 71 holes and 6,926 yards of golfing bliss. Given the spectacular scenery, it may be hard to keep your eye on the ball. Among its signature holes is the par 3 No. 4, boasting dramatic waterfalls along the entire front edge of the green and is connected to the fairway by the Winnie Palmer Memorial Bridge, a tribute to Palmer's late wife. Want to map out your strategy for each hole? No problem. All carts are equipped with a state-of-the-art ParView GPS system. Arnie himself played a six-hole exhibition on the course during the grand opening and unabashedly exclaimed, "The Palmer Course at La Cantera is one-of-a-kind and a first-class golfing experience."